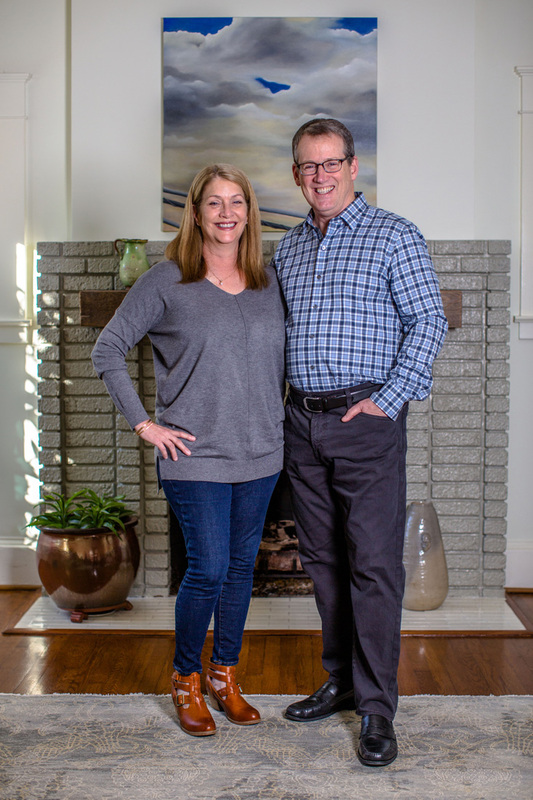 When Paul Leonard’s work as an environmental water consultant brought him to Atlanta from Baltimore in 1995, he and his wife, Julie, and their two children lived in a small apartment in Inman Park. However, they soon began house hunting and found their current home in Virginia-Highland. The Leonards chose the 1920s Craftsman because they liked the school district—an important factor. Another was price. “We chose this house because we could afford it,” says Julie, a school psychologist. In 2004, the couple embarked on a hard renovation of the house. “We tore out everything,” Julie says. They put in a new kitchen and a great room, then restructured the second floor. The entire project took one year to complete. After it was finished, the Leonards were content to enjoy the house in its new state. But 2015 would bring more changes. The children were off to college, and Mom and Dad were ready for something new. 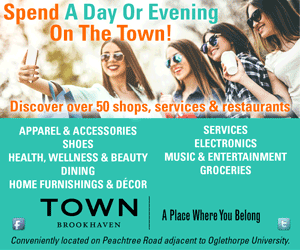 They enlisted the services of Stephanie Andrews and Elisabeth Paulson of Balance Design Atlanta in Lake Claire. “The Leonards wanted to create a home that reflected a life well lived, their quirky sense of humor and a comfortable, layered space to relax and enjoy,” Andrews says. 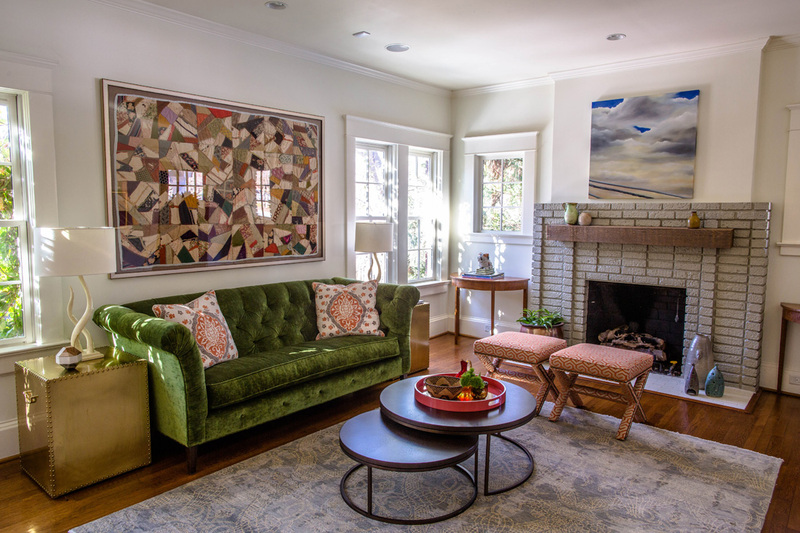 Julie’s grandmother’s quilt dominates the living room, influencing the space’s color palette. Having never worked with an interior designer before, the couple wasn’t entirely sure how to proceed. “I created a look book of fabrics, dishes, clothing, color and styles I liked,” Julie says. It was quite a collection, according to Andrews. “They showed us New York Times style sections, art and travel pictures they had collected over the years, and her grandmother’s quilt from the turn of the century,” Andrews says. The Balance Design team put together some presentations, the Leonards made their selections and the project was underway. In the living room, the fireplace was rebuilt, and a wool-and-silk rug was brought in to anchor the space. An emerald velvet Norwalk sofa from Trinity Mercantile & Design Co. in Decatur was paired with a mid-century leather lounge chair from Room and Board on Midtown’s Westside. 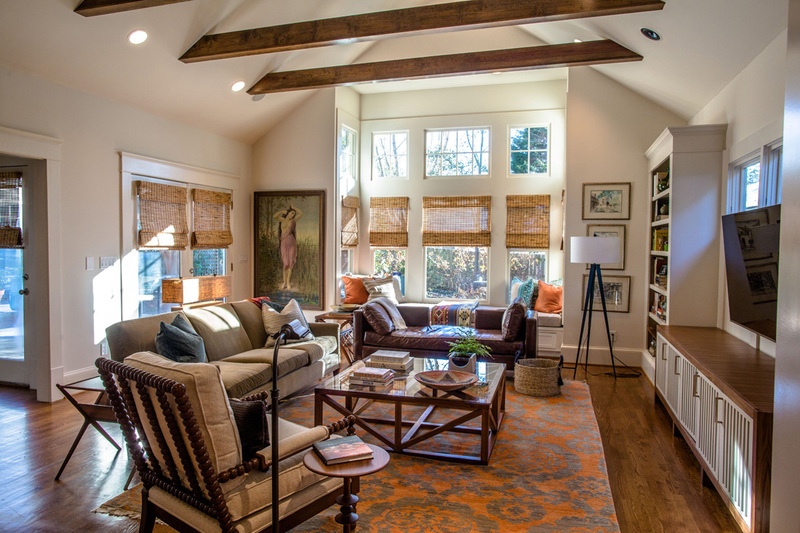 The Leonards wanted the great room to be a comfortable space where they could relax. Julie found the living room’s twin side tables at an antique store in Madison, Georgia. “I just knew they had to come home with me,” she says. She had a similar sentiment about the matching bulldog bookends resting on those tables. Julie originally purchased those for a friend’s baby shower gift, which she wanted to package with a selection of children’s books. But when the bookends arrived, they were larger than Julie had expected, so she decided to keep them for herself. 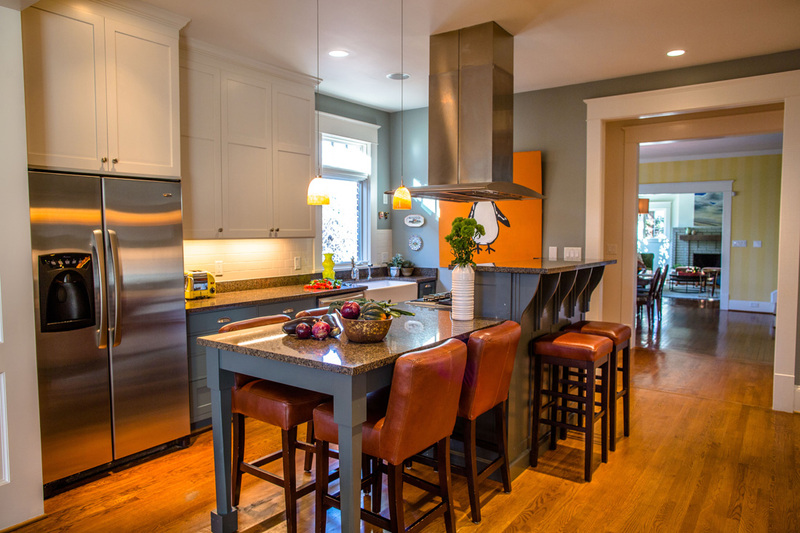 The kitchen was designed for entertaining, which the Leonards often do. Dominating the room is the quilt made by Julie’s grandmother that was custom-framed by Moog Gallery in Candler Park. “Stephanie really helped us with how to make our art flow,” Julie says. “Everything on the walls has a great story, and that’s really important to me.” Another example is the painting of the penguin in the kitchen. The Leonards were attending a student art show at Grady High School when they saw it and knew they wanted it. In the great room hangs a collection of three paintings Julie’s parents purchased during a visit to New Orleans in the 1960s. 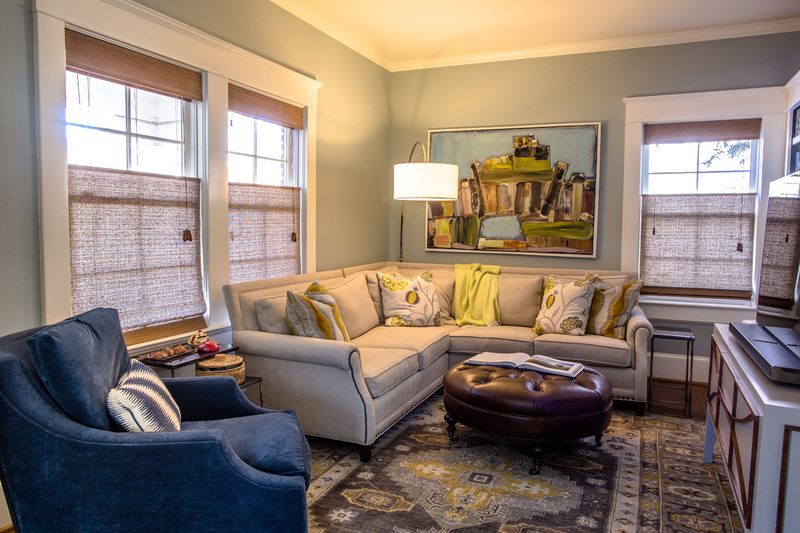 As part of the project, the den received new, comfortable furnishings, including a CR Laine sectional by Trinity Mercantile & Design Co., a Lee Industries leather ottoman from Upcountry Home in downtown and a custom-designed media console by Balance Design Atlanta. 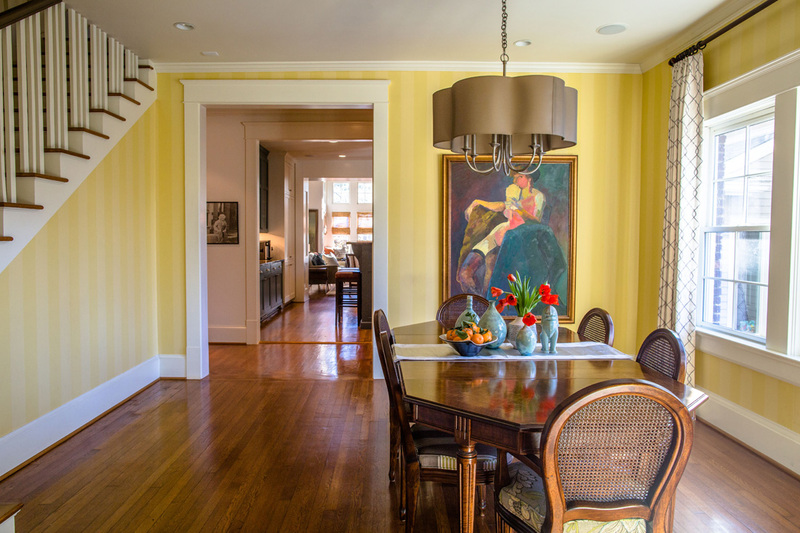 Like the kitchen, the dining room didn’t receive much attention because the Leonards were already satisfied with it, including the 1960s-era table and chairs from Julie’s side of the family. The powder room between the dining room and kitchen received a fresh, updated look, thanks to the Hygge & West wallpaper dominated by red birds flying among the clouds. 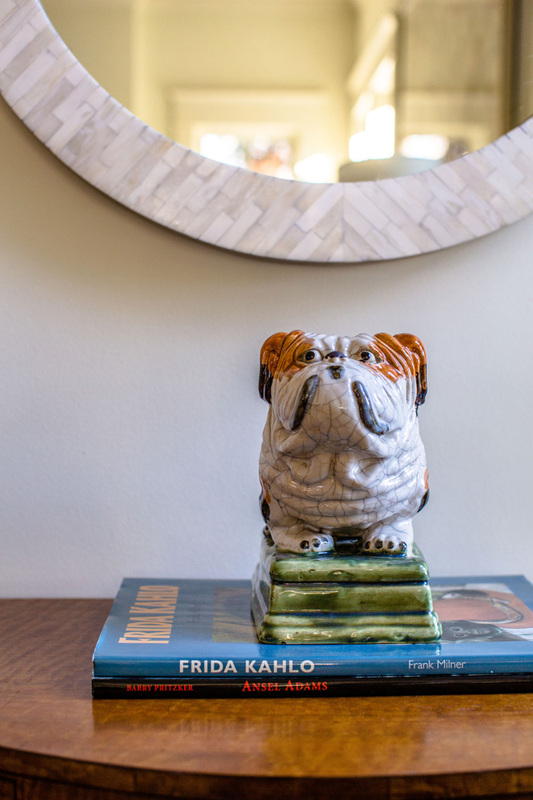 Though she originally purchased Bulldog bookends for a friend, Julie decided to keep the bulldog bookends for herself. For the great room, the couple had a custom-designed media console built by Balance Design Atlanta to accommodate the TV and its many accessories. Comfortable furnishings include a CR Laine sofa and spool chair, along with a custom coffee table purchased at Made Goods in Inman Park. One piece Julie especially wanted was the leather daybed, purchased at Mitchell Gold + Bob Williams in Buckhead. “I wanted a comfortable place where I could curl up and read a book,” she says. The couple left a circe-1960s table and chairs from Julie’s family in the dining room, which was untouched during the redesign. One area that wasn’t included in the redesign but remains an integral part of the Leonard home is the outdoor living space in the backyard. Complete with a fireplace, the area features a dining table and chairs plus a collection of outdoor chairs surrounding the fireplace. A basket overflowing with blankets is nearby so family and guests can bundle up on cool nights. Julie says it’s the site of many boisterous game nights with friends, as well as a common gathering spot for the Leonard children and their friends when they come home for a visit. The den features more pieces, such as the CR Laine sectional, to ensure comfort.